skills training, parent management training, and home visiting programs are among the most effective early prevention programs. Criminologists David Farrington and Brandon Welsh also outline a policy strategy--early prevention--that uses this current research knowledge and brings into sharper focus what America's national crime fighting priority ought to be. 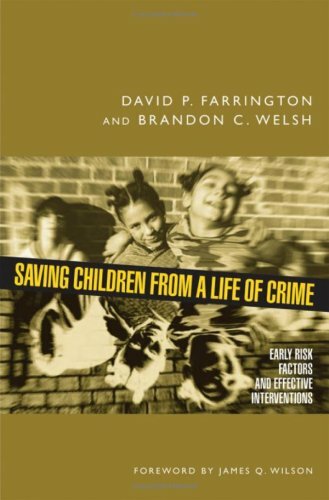 At a time when unacceptable crime levels in America, rising criminal justice costs, and a punitive crime policy have spurred a growing interest in the early prevention of delinquency, Farrington and Welsh here lay the groundwork for change with a comprehensive national prevention strategy to save children from a life of crime.